My MedScan in cw 45/46. First snow in my area brought a snow calamity on roads, with just 3 cm :-). We all watched the US elections, of course. And, my country is celebrating an anniversary of our Velvet Revolution and exciting „revolutionary“ weeks in 1989. So much has changed since communism times! Imagine that you can once assess the state and treatment effect of drugs in people with Huntington´s disease (HD), a rare neurodegenerative disease affecting individuals as early as at their 30s. And you would just need blood or skin samples which are feasible to obtain in contrast to brain tissue. Researchers recently published findings in HD mice on biomarker changes in blood, skin and muscle tissue after treatment with an experimental drug P110, an inhibitor of mitochondrial fragmentation. Huntington´s disease is not yet curable. One of my clients is also developing biomarkers for HD from peripheral samples. His work is based on long-term proteomic work in this field and the biomarkers could be, once validated, used for precision medicine, stratification of patients as well as for determination of treatment effect of prospective drugs. Really exciting work! For those interesting to collaborate, just contact me at info@martinalutter.com. Further new HD articles interesting to read: Hunt for Huntington’s cause yields clues; Targeting CAG repeat RNAs reduces Huntington’s disease phenotype independently of huntingtin levels. Monobodies for treatment of cancer? We all know polyclonal or monoclonal antibodies. But what are monobodies? I went back to literature and found out that monobodies as such were firstly discovered in 1998 by Koide S., however the term monobody came later, in 2002. Koide with his colleagues constructed small antibody mimics, termed “monobodies,” using a small β-sheet protein scaffold, the tenth fibronectin type III domain from human fibronectin. Loop regions of this construct can be diversified to bind with high affinity to a specific target. They are stable, do not contain disulfide bonds and are therefore not affected by the redox environment inside a cell. This feature predetermine them for using as probes and/or inhibitors inside cells for proteins of interest. Mutation in RAS genes are present in nearly 30% of human cancers, and specifically, in 90% of pancreatic adenocarcinoma. There have been many attempts to target changed RAS proteins. Researchers from University of Illinois at Chicago, while searching for RAS proteins regions critical for their function, have found the monobody NS1 which is inhibiting a downstream activation of two of three RAS proteins. Such monobody can further be tested to asses its therapeutic capacity to treat pancreatic or melanoma cancer. „The defective proteins that are widely thought to kill brain neurons and cause, or at least indicate, Alzheimer’s disease do not always have that calamitous result, scientists reported on Monday, raising more doubts about conventional approaches to diagnosing and finding treatments for Alzheimer’s.“ This very interesting article in STAT picked some questions researchers mentioned in their scientific presentation. There are already evidences out there as far back as 1991 that „many people have amyloid plaques in the brain but have no symptoms of cognitive decline or Alzheimer´s disease“. This has been also observed in AD animal models. Taking in account that there are PET tracers regularly used (and FDA approved) also in clinical trials assessing the effect of AD drug candidates by visualizing amyloid plaques and there are Aβ- and Tau-hypothese drugs in development, one can just ask what we find lastly. Other new AD articles worthy to read: Episodic Memory of Odors Stratifies Alzheimer Biomarkers in Normal Elderly; Probiotics improve cognition in Alzheimer’s patients; Tau Oligomers Associate with Inflammation in the Brain and Retina of Tauopathy Mice and in Neurodegenerative Diseases. And two further new articles, amyloid-connected: Camelid single-domain antibodies: A versatile tool for in vivo imaging of extracellular and intracellular brain targets; Merck´s The BACE1 inhibitor verubecestat (MK-8931) reduces CNS β-amyloid in animal models and in Alzheimer’s disease patients. 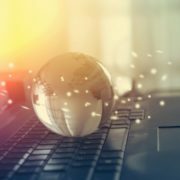 An interesting article reflecting a big need for big data science. No comments are needed, just read it on your own. A debilitating disease affecting around 10 million people in the world was described 200 years ago by James Parkinson. Where we are in understanding of underlying mechanisms of the disease, what treatments are available and what treatments could be available in near future? In the Nature Outlook released in October 2016 you can read more from recent and breakthrough findings as published in Nature journals. It really could matter whether you grow your cancer cells on a flat surface of a plate or you use a kind of in vivo tumor growth simulation. Exposing such cell communities to potential drugs can give different results as you can see in this release. Last week I also met a guy from a start-up company in Czech Republic and they offer a system for cell cultivation on a nanofibrous 3-D culture system. They have been able to see assembling of osteosarcoma cells to spheroid-like structures mimicking avascular tumour environment. Probably, worthy to test. 27.10.2016: When sequencing a tumor genome, to what you should compare the results? Comparison of genetic mutations found in tumours is usually done to a human reference genome. But, as scientists found and published, „a preferred method might be de novo assembly of personalized normal control genome and cancer cell genome, instead of mapping and aligning NGS [next generation sequencing] data to mouse or human reference genome“. Main reason for that is presence of differences (e.g mutations, translocations, etc.) in a DNA of a single organism in comparison to another organism found already in normal cells. When you then compare tumor tissue from such organism to a reference DNA from a database, you can account wrongly these differences as a pathological change of DNA in a tumor. In addition to the above article and not connected just to cancer, recent analysis showed that we should „rethink the links between genes and disease“ and see whether a gene variant firstly suspected to be involved in a disease is not too common to do so, in other words, it can be harmless. Time to a „radical revision in human genetics“? Ganymed Pharmaceuticals is developing antibodies against unique cancer target(s). After July announcement of positive results on significant improvement of gastric patients survival by the mAb targeting Claudin18.2, on October 31 they announced becoming a wholly owned subsidiary of Astellas. For the shareholders, this transaction brings an exit worth EUR 422 millions and future EUR 866 mil in contingent payments if the candidate mAb IMAB362 succeds in clinical development. I would say, very good and congratulations! Another biotech company with the same investors (Strüngmann Family Office and MIG funds), BioNTech, is also doing well. 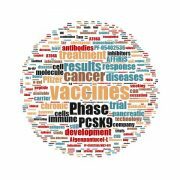 In September 2016, they announced entering into the strategic collaboration with Genentech ( a member of the Roche group), on developing, manufacturing and commercializing novel messenger RNA (mRNA)-based, individualized cancer vaccines. Worth $ 310 mil plus milestone payments. 1.11.2016 Pfizer stops development of their late stage PCSK9 mAb but what about their small molecule and a vaccine targeting the same molecule? Bococizumab, a cholesterol-lowering monoclonal antibody, will not be further developed at Pfizer and the company is discontinuing also two outcome clinical studies. The outcome studies should have assessed whether the PCSK9 inhibitor can, besides lowering of LDLc, lower also incidence of cardiovascular diseases. Observing recent performance of Praluent and Repatha sales (both PCSK9 mAbs, approved and launched last year) which are far lower than expected by the launching companies and all the analysts, the Pfizer´s decision is not so surprising. In addition, Pfizer openly said that its Bococizumab faces attenuation of low-density lipoprotein cholesterol (LDL-C) lowering over time, induce unwanted antibodies against it and has also higher injection-side reactions. However, Pfizer has not developed just a PCSK9 mAb. They have a so called „PCSK9 franchise“ which contains besides the advanced mAb also a small molecule and a vaccine targeting PCSK9, both in preclinical stages. What will be the fate of these candidates? Will they be also stopped? By my meaning not, however a need for long-lasting outcome studies can prevent continuation at Pfizer especially when the competitor´s outcome studies with PCSK9 mAbs do not show convincing results. In the Part I we had seen which therapeutic areas were covered by approved drugs in EU in 2015 and also how many drugs of special assignments had been approved. Interestingly, more than 77% of new drugs approved in EU in 2015 had been firstly approved in USA. This means that new drugs in EU were not so new to the other world, at least not to USA. In the current article I will have a look on other interesting facts from the authorised medicinal products in EU in 2015, like the most active companies and manufacturers or where are the Marketing Authorisation Holders (MAH) based or which drugs are the “most copied”. Marketing authorisation is an act done by European Commission (EC) based on evaluation and recommendation of European Medicines Agency (EMA) and this allows drugs to enter the EU market. 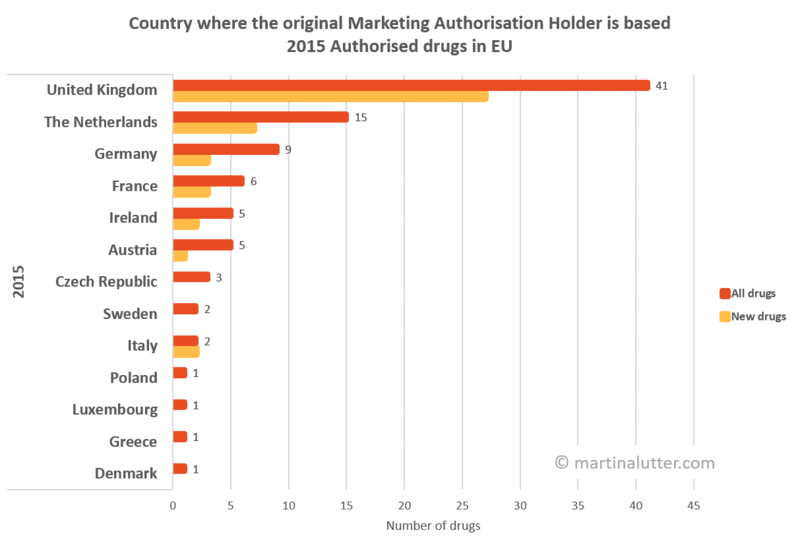 Market authorisation holders (MAH) with the highest number authorisations in 2015 in EU. First number always represents number of all drugs, a number under the slash represents number of new drugs. When we look at the most active companies for all drugs authorised in EU in 2015, we see that leaders are Novartis, Amgen and Merck&Co. Novartis had 5 new drugs authorised, Amgen had 4 and Merck&Co 3 new drugs approved in 2015 in EU. 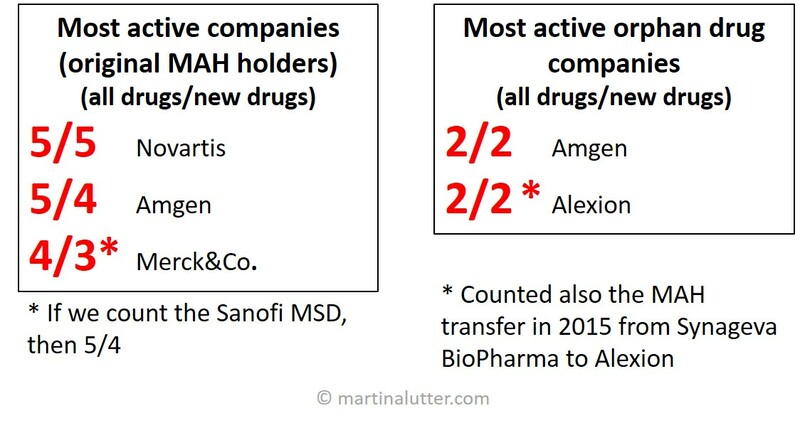 Looking at the situation today after MAH transfers, and counting also the Sanofi MSD´s vaccine, Merck&Co is the MAH of 6 drugs approved in 2015, 5 of them are new EU drugs. The change of the MAH for one drug from Cubist to Merck&Co happened beginning of 2016. Interestingly, the biggest pharma, Pfizer, did not have any EU authorised drug in 2015 on its own. However, after acquiring a generic company in September 2015, Pfizer is a kind “present” in new authorisations with 3 Hospira generics. The most active orphan drug companies are Alexion and Amgen. Alexion is the MAH for 2 orphan drugs which will be an addition to its Soliris, so far the most expensive drug. These 2 drugs will according to available information not be too much with a price behind this old drug. One drug, Kanuma, was originally authorised for Synageva, however after the $ 8.4 billion deal and the MAH transfer in 2015, Alexion is the MAH for this drug now. Alexion with its Solaris orphan market exclusivity which was extended after obtaining a paediatric reward until 2019 and 2023 for two indications, respectively, will have another two orphan drugs, Kanuma and Strensiq, protected until 2025. Among the most employed manufacturers, based on official EMA documents, are Novartis Pharma GmbH, Germany; Mylan Hungary Kft, Hungary; Almac Pharma Services Ltd, UK; Amgen Europe B.V, The Netherlands; Lek Pharmaceuticals, d.d, Slovenia and Genzyme Ireland Ltd, Ireland. Further to orphan drugs, originally there were 18 drugs assigned as orphan drugs but 3 assignments were removed based on request of an MAH. 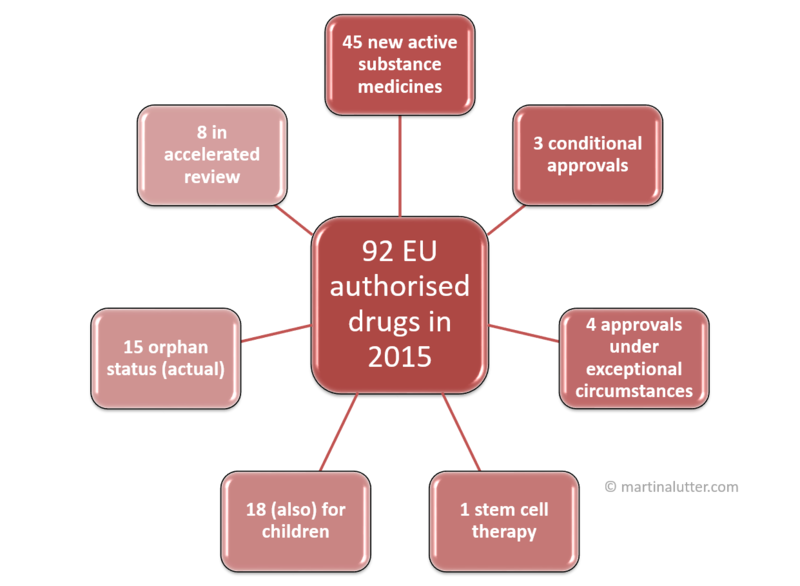 Therefore, the actual number of orphan drugs authorised in EU in 2015 is 15. All except one, are also new active substance medicines (new drugs). 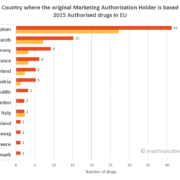 Original MAHs of 41% of all drugs authorised in 2015 to enter the EU market are based in United Kingdom. This seems to be a consequence of superior tax conditions in UK. The Netherlands is following with less than half of MAHs as in UK. As clearly visible, more than half of EU countries are not present at all. Until now, I have identified 9 drugs in which the MAH has been changed. Therefore, the current proportion of countries where the MAH is based, is slightly different in comparison to the status at authorisation. Looking at the generics centrally authorised in 2015 to enter the EU market, it is obvious that the “most copied” drugs are Lyrica, Alimta and Abilify. Both, Lyrica and Abilify, are nervous system drugs, with the active substance pregabalin and aripiprazole, respectively, and Alimta is another pemetrexed used for cancer treatment. Alimta (Eli Lilly) was approved by EC in 2004 similarly to Lyrica (Pfizer) and Abilify (Otsuka). Companies with the highest number of generics authorised to enter an EU market are classical generic companies like Sandoz (Novartis), Accord Healthcare, Generics, Hospira (now part of Pfizer) and Zentiva. Sandoz has 4 and all other companies mentioned have each 3 generic drugs authorised in 2015 in EU. I will continue in bringing other interesting facts on the authorised medicinal products in EU in 2015 in some of the following blogs. For further facts and information, download our free report. For inquiry on detailed analysis with single drugs categorized based on certain parameters and further custom-made analysis from this dataset, please contact us on info@martinalutter.com. Examples of other parameters which can be used in analysis include application types (e.g new active substances, fixed combination, etc. ), most active companies, most active orphan drug companies and most employed drug manufacturers, chemical subgroup (ATC) categories (e.g monoclonal Abs, protein kinase inhibitors, etc. ), closer look on generics (most “copied drugs, most active generics companies), countries where the MAH is based, biologicals type, manufacturing (e.g chemical synthesis, recombinant DNA technology, etc. ), organisms used for DNA recombinantly produced drugs, methods of administration and others. When I was looking for some overview of medicinal products authorised in 2015 to enter the European Union (EU) market, I was not really able to find any. There is a report released by the European Medicines Agency (EMA) in May 2016 and it is connected to the drugs recommended in 2015 by EMA and its Committee for Medicinal Products for Human Use (CHMP) for authorisations which are basically not the same as drugs actually authorised in EU in 2015. 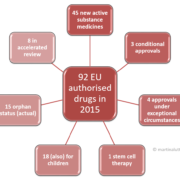 In EU, the European Commission (EC) is the authority to allow a drug to be centrally authorised to enter the EU market and in 2015, the EC authorised 92 drugs. They are displayed nowadays in the EC community register. Besides this centralized market authorisation, national agencies can grant a drug an access to a local market for certain drugs. I created my own review on drugs centrally authorised by EC in 2015 to enter the EU market and I categorized drugs according to certain categories. In such way I can easily identify which medicinal products are e.g manufactured by DNA technology, or how many drugs are also for children or which drug was the “most copied” in 2015 among generics and other information. EMA is based in London, UK and when the Brexit becomes a reality, this institution will most probably move to another European country to serve from the EU area. Four drugs were approved under exceptional circumstances, 3 were conditionally approved and 8 were evaluated under the accelerated review. The accelerated review means that CHMP is doing evaluation under shortened time. However, this was not always translated into a quicker approval since other factors appearing during the evaluation process at EMA like questions and answer processes, etc. could slow the whole procedure. It is obvious that the highest proportion of the drugs approved were in area of cancer and immunomodulation. The nervous system drugs were closely followed. But when we look at new active substance medicines (not previously approved in EU), there is only one new drug authorised in EU in the nervous system area. This anatomical main group (according to the ATC) has also the highest number of generic applications. 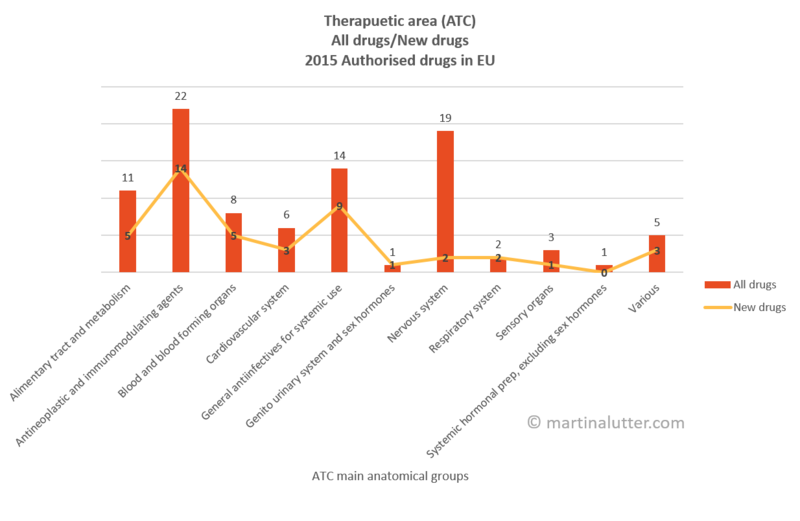 Antiinfectives are the second numerous group among new EU drugs in 2015 with 6 drugs authorised to enter the market. I was also curious how many drugs were approved by EC for children (less than 18 years). Need to say that there are drugs which are exclusively for children and drugs which are also for children. I refer here to all the drugs which can be used for children. Out of 92 drugs, this is only 18 (19,5%) drugs. Very similar ratio we can see also among new drugs- 8 new drugs (18%) are foreseen also for children. Drugs for nervous system diseases are the most numerous among all drugs used also in children. However, the Alimentary tract and metabolism area is the lead when talking about new drugs for children with 3 drugs for orphan diseases including the one with the highest foreseen price. EU vs USA: 2015 Authorised drugs. EC=European Commission; FDA= U.S Food and drug administration. Orphan drug: in EU for diseases affecting no more than 5 people out of 10,000, in USA: for diseases affecting no more than 200,000 Americans. Most of the new drugs in EU in 2015 had been approved firstly in USA- more than 77% and only after that they were approved in EU. Some of the new drugs had been approved in USA years before EU, some only a few days. 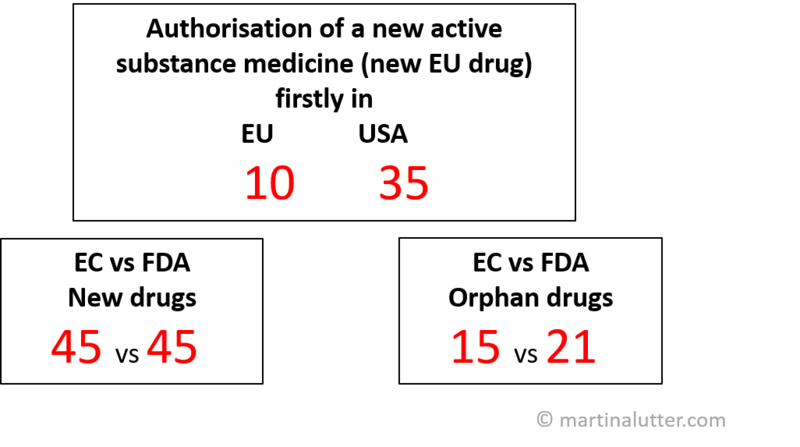 This can reflect preferences of companies applying for market authorisation, different lengths and requirements of authorisation process in USA and in EU, attitude of authorisation agencies to certain treatments and potentially also differences in drug development activities in Europe and USA. There are 5 new drugs in 2015 which are so far approved in EU and not in USA, among them a labelling agent not directly used in patients or a stem cell therapy- Ex vivo expanded autologous human corneal epithelial cells containing stem cells. For further facts and information, download a report for free from our website. For inquiry on detailed analysis with single drugs authorised in EU in 2015 and categorized according to certain parameters and further custom-made analysis from this dataset, please contact us on info@martinalutter.com. Examples of other parameters which can be used in analysis include application types (e.g new active substances, fixed combination, etc. ), most active companies, most active orphan drug companies and most employed drug manufacturers, chemical subgroup (ATC) categories (e.g monoclonal Abs, protein kinase inhibitors, etc. ), closer look on generics (most “copied drugs, most active generics companies), countries where the MAH is based, biologicals type, manufacturing (e.g chemical synthesis, recombinant DNA technology, etc. ), organisms used for DNA recombinantly produced drugs, methods of administration and others. The Phase I trial with the BIA 10-2474 drug of the Portugese company Bial done in French Rennes was stopped in January 2016 after occurring serious complications in 6 volunteers from the same trial arm. One man died. ANSM, the French regulatory authority, released on 19th April 2016 a final report which summarizes findings of the BIA 10-2474 trial by the special scientific committee (CSST) established in January 21st, 2016. Aim of this committee was to analyze mode of action and possible toxicity of the BIA 10-2474 (direct or indirect), to formulate hypothesis to explain toxicity and to adopt global recommendations for first-in-human (FIH) trials. The BIA 10-2474 belongs to a class of fatty acid amid hydrolase (FAAH) inhibitors which act by degrading an enzyme anandamide, a mediator of endocannabinoid system. There have been more than 6 drug candidates in development, no one yet marketed due to low efficacy. These drugs have been developed for such indications like pain, vomiting, anxiety, mood disorders, Parkinson´s disease, Huntington´s disease and some cardiovascular indications by companies like Sanofi-Aventis, Astellas, BMS, Pfizer and Janssen. Janssen voluntarily suspended its Phase II trials with JNJ-42165279 until they will have more information. Bial has tested its drug for neuropathic pain. Bial has 6 candidates in its pipeline, with one product already marketed for one indication in EU and USA and one product registered, both in central nervous system indications. The committee at ANSM had a closer look on preclinical findings on the BIA 10-2474 and the Investigational Brochure (IB) accompanied the FIH filing. The BIA 10-2474 showed in in vitro studies quite low activity, in other words IC50 lies in a micromolar range. For those involved in small molecule drug development it is obvious that this compound was quite weak since usually companies move to further development compounds with a nanomolar range found in vitro. Actually, when the molecule was compared to an existing reference molecule in animal pain killing tests, BIA 10-2474 was less effective. Interestingly, the reference molecule values were removed from one figure in the IB. Further, the drug was not very specific and it also expressed a very narrow concentration range between an absence of inhibition and total inhibition. The latter fact means that even a small concentration change can lead to a significant effect. When compared to other developmental molecules in the class, based on preclinically obtained characteristics on specificity and efficacy, the BIA 10-2474 was not very competitive to stronger candidates (e.g from Pfizer or Janssen). What was quite unusual was toxicology testing of BIA 10-2474 in 4 different animal models- rat, mouse, dog and monkey and in addition, in rabbits for fertility and reproduction studies. Toxicology studies are prerequisites for clinical testing, they are done in a GLP (Good Laboratory Praxis) environment and are quite expensive. There was no noticeable toxicity found in particular organs except of gametes (observed also with other FAAH inhibitors). On the basis of NOAEL (no observed adverse effect level), 100 mg dose was chosen as the highest dose in humans. However, the study in dogs had to be redesigned since serious pulmonary events and signs of motor coordination problems occurred. In dogs, the NOAEL was set to 20 mg. The CSST committee in its report concluded based on information provided that the BIA 10-2474 could not be a priori regarded as a risk product according to valid criteria and therefore was allowed to continue to a first-in-human trial. The BIA 10-2474 trial started in 2015 (no information in usual clinical trials registers) and had several arms, consisting of single doses (ranging from 0,25 to 100 mg) and repeated doses (from 2.5 mg to 50 mg). Analysis during the trial showed 50% of FAAH inhibition in humans with a 0,25 mg dose and the dose 5 mg showed nearly 100% FAAH inhibition. This was however far less (10x) than the extrapolated dose from animal studies. The volunteers were involved in the injection schedule sequentially, based on results from previous treatments to increase safety of participants. In January 10th, 2016, one man was hospitalized after the 5th injection of the 50 mg dose (cumulative dose 250 mg). Other 5 were at that time without apparent problems. 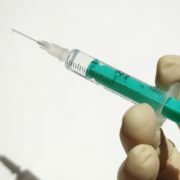 They got their 6th injection next morning (cumulative dose 300 mg) without waiting for results of the hospitalized man. Then, 2 to 4 days after the last injections these 5 people were also hospitalized due to brain bleeding and other neurological symptoms and the first man died at the 3rd day after first symptoms occurred. No other volunteers except of this cohort #5 (repeated 50 mg dose) showed any marks of toxicity, especially not of neurological origin. Due to gradual accumulation in brain (effect on brain functions occurred after the 5th injection of 50 mg dose. A single 100 mg dose did not cause any effect). The committee, despite concluding that there was a rationale behind allowance of the candidate for clinical testing, mentioned that there was a fair number of errors, inaccuracies, reversing numbers, erroneous translations of document sources in the IB provided by the company. According to the report in Nature, many researchers believe that BIA 10-2474 is acting ‘off-target’. After publication of the Clinical Study Protocol, there were efforts to assess these “off-targets”, e.g. one company involved its proprietary software and predicted a mechanism by which the drug candidate could cause the death and serious adverse effects in the trial. A debate is needed on European and international level about access to data of first in human administration and to toxicological data in order to protect persons involved in future trials. Especially the last point is very important- should be a trade secrecy more than a human life? I am sure we agree it should not. Update: “A French health ministry (on 23.5.2016) ruling faulted both Portugal-based Bial-Portela and the French laboratory Biotrial for a failed drug trial that left one patient dead and five others hospitalized earlier this year. Marisol Touraine, France’s health minister, said that although neither company violated health legislation in France, both share responsibility over the dosage of the medication given to patients as well as criticism over the time it took to seek medical assistance after the first patient became ill, Reuters reported Monday”. More information here. Update 2: 27.5.2016 “The European Medicines Agency (EMA) has started a review of the guidelines that describe first-in-human clinical trials and the data needed to enable their appropriate design and allow initiation. The review will identify which areas may need to be revised in the light of the tragic incident which took place during a Phase I first-in-human clinicial trial in Rennes, France, in January 2016.” This action is directly connected to the recommendation No. 5 of the CSST as mentioned above. 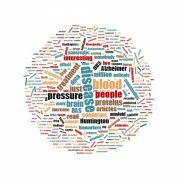 What do you think have diseases like Huntington´s disease, Fabry disease, Amyotrophic lateral sclerosis, Fragile X syndrome and cystic fibrosis in common? They belong to rare diseases, diseases that affect no more than 5 people out of 10 000 in EU which means that about 250 000 people maximally are affected by a single disease. However, in most cases there is 1 person in 100 000 affected by a disease. It is therefore not so hard to imagine that this number of patients is not so attractive for drug developers since they reasonably expect that they cannot get returned their investment into a drug development by selling such medicine on this small market. Just to imagine how many people together are affected by rare diseases- a few numbers from the European Medicine Agency (EMA) webpage: There exist 5000 to 8000 distinct rare diseases, affecting between 27 mil and 36 mil people in EU. Most of the rare diseases are caused by a genetic origin and rest is accounted to degenerative and proliferative causes. Taken in account that there are a few medicines available and there is a lack of any scientific information about most of the rare diseases, we can see an urgent unmet medical need here and millions of people left without any hope. Despite predominantly governments are in duty to take care of public health and act in public interest and to provide help also to people with rare diseases, we see numerous initiatives supporting development of orphan drugs funded above all by non-governmental bodies. This is quite straightforward definition. Such medicine can then benefit from certain incentives such as protection from competition once on the market (for 10 years) or protocol assistance. There are further incentives for SMEs like reduced fees and administrative and procedural assistance from EMA. 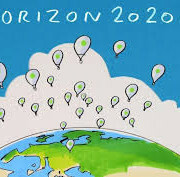 As we will discuss next, in frame of the Horizon 2020, an EU funding program for scientific projects, there have been calls running and in preparation to support development of orphan drugs. In the past, there have been already some calls within the Horizon 2020 which fully or partly touched rare diseases like PHC-14-2015, FPA-01-2014, SC1-PM-12-2016 or INFRAIA-1-2014-2015. For the open calls, we can mention the NMBP-10-2016 call (Nanoformulation of biologicals) ending in May 2016 and ERN-01-2016 (ERN-2016 – European Reference Networks – Framework Partnership Agreement) with deadline in June 2016 which are partly focused also on rare diseases. Two forthcoming calls are the most relevant and specifically focused on rare diseases. The SC1-PM-03-2017 call (Diagnostic characterisation of rare diseases) will be open in July, 29th, 2016 and closed in April, 11th, 2017. Aim of this call is to apply genomics and other –omics or high–throughput approaches for molecular characterization of rare diseases. This is thought to be a large-scale proposal with an expected EU contribution at around 15 mil EUR. The selected proposal shall contribute to the objectives of, and follow the guidelines and policies of the International Rare Diseases Research Consortium IRDiRC (www.irdirc.org). The second call SC1-PM-08-2017 (New therapies for rare diseases ) is fully dedicated to clinical development of orphan drugs, it is planned to be open in July 2016 and a deadline for the 1st stage is planned to be in October 2016 and for the 2nd stage in April 2017. 3) A clear patient recruitment strategy is presented. Again here, the proposals should follow the guidelines and policies of IRDiRC. According to the SC1-PM-08-2017 topic description, “the intervention must have been granted the EU orphan designation at the latest on the date of the full proposal call closure”. The whole procedure for orphan drug designation at EMA takes in full about 11,5 months from date of filing (it is also recommended to have free pre-submission meetings with the EMA Orphan Medicines Office and EMA Scientific Advice Office). So, if a drug developer does not have yet an orphan drug designation for a drug to be a part of the SC-1-PM-08-2017 call, it has to be applied at latest in next few days to keep Horizon 2020 timelines. Otherwise this call will be applicable only to drug developers having already the orphan drug designation or being already in process of getting it. Though drug developers have not had in the past so much interest in orphan drug development, situation is changing due to more factors. An increasing support from EU, governments and non-governmental organizations is one reason. A second factor is that companies can use the orphan drug as a “lift” for other drugs, e.g targeting the same molecule. Orphan drugs will take advantages of its designation to get incentives and to be on market quicker than a usual drug and to get longer protection and the second-use drug can profit from that. At last, involvement in development of a drug for people left without any hope and even knowing that the direct return of investment will be low or none, can improve public image of pharmaceutical industry and companies involved. None of these reasons is bad and if at the end they improve understanding of rare diseases and can help millions of people, this is something which counts and matters. 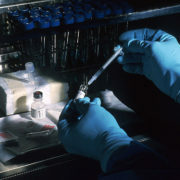 Highly awaited results from the Phase III study with evacetrapib which was stopped in October 2015 on the recommendation of the independent Data Monitoring Committee after preliminary data suggested the study would not meet its primary endpoint of a reduction in major cardiovascular events were presented recently at the American College of Cardiology’s 65th Annual Scientific Session. The original article you can find here. Results clearly showed that despite significant decrease of “bad” cholesterol- LDL (i.e LDL- low density lipoprotein) and increase of “good” cholesterol- HDL (high density lipoprotein), the rate of cardiovascular events was not reduced. High cholesterol is thought to be a risk factor for heart and vascular failures and changing a lipoprotein profile is thought to modify this risk. Diet recommendations as well as drug treatments by statins, PCSK9 inhibitors, selective cholesterol absorption inhibitors, bile acids-binding drugs and other lipid lowering therapies are ways how to lower LDL currently in clinic. 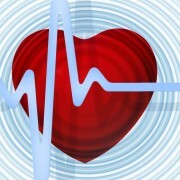 In case of statins, large population studies showed an effect on cardiovascular diseases rate. A new group of cholesterol-lowering drugs targeting the PCSK9 molecule (among them two approved and marketed monoclonal antibodies) is awaiting outcome studies on modification of cardiovascular events soon, showing clearly significant cholesterol lowering in indications where statins were not effective or tolerated. Evacetrapib belongs to a class of CETP inhibitors. CETP is a “cholesterylester transfer protein” which transfers cholesterol from HDL to VLDL (very low density lipoprotein) and LDL. Evacetrapib as a CETP inhibitor thus increases HDL and lowers LDL. The investigational name for this drug is LY2484595 and it has been in development at Eli Lilly and Company. The drug was tested in more than 12 000 people and most probably only such high participants number tested through sufficient time period could show a meaningful outcome. This class of drugs has faced already a 3rd failure, all small molecules. The first failure, Torcetrapib, was in development at Pfizer and was stopped in 2006 after excessive deaths in the Phase III. Roche´s Dalcetrapib development discontinued in 2012 due to a lack of efficacy. There are two candidates in active development at Merck and Amgen. Merck´s Anacetrapib is currently in 3 Phase II studies- NCT00685776 (a long-term study since 2008, running until 2017), NCT01252953 (REVEAL, running until 2017) and NCT01524289 for heterozygous familial hypercholesterolemia patients in combination with statins (results will be available in 2018). The drug previously also showed significant effect on cholesterol levels. Another CETP inhibitor, originally developed by Dezima and Xention as TA-8995 and which is now in portfolio of Amgen as AMG 899 showed promising results on LDL decreasing and HDL increasing in the TULIP Phase II as announced in 2015 and it was claimed that it is the most potent CETP inhibitor in means of cholesterol lowering. There is no active clinical trial with AMG 899 or TA-8995 running according to www.clinicaltrials.gov. Of course, now, everybody is watching whether it will be possible to see an effect on cardiovascular diseases rate with these two active CETP drugs. Let´s have a look on other cholesterol-lowering drugs, PCSK9 inhibitors. Two monoclonal antibodies were approved and marketed in 2015, other drugs are in development at Pfizer, Lilly, AFFiRiS, Alnylam and others. These drugs are of other class than CETP inhibitors, lowering LDL and increasing HDL by other mechanisms. Several “outcome” trials are running with Pfizer´s bococizumab and Amgen´s and Sanofi´s/Regeneron´s marketed mAbs to bring an evidence that these drugs in parallel to modifying a lipoprotein profile can also reduce cardiovascular diseases rate. 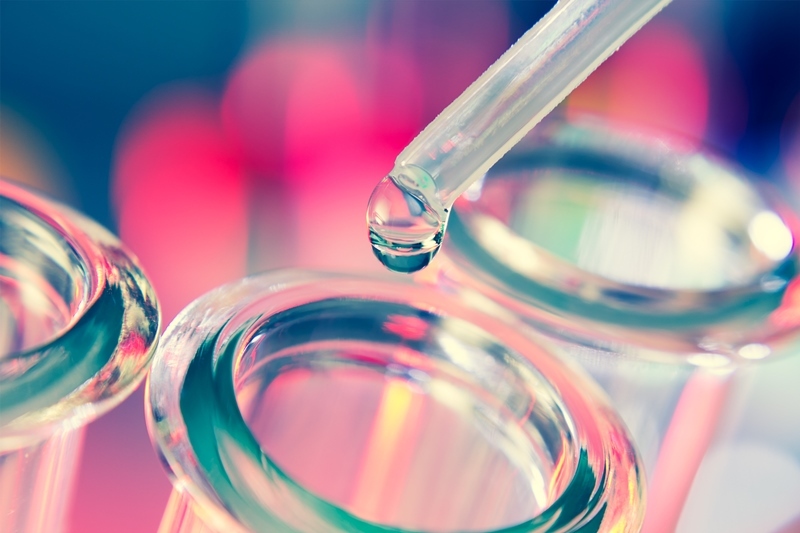 Pfizer recently announced positive results on one Phase III study with bococizumab which met its primary endpoints and led to a significant LDL decrease. The study is expected to be a part of potential regulatory filing. It automatically comes to one´s mind: Why significant decrease of bad cholesterol and increase of good cholesterol induced so far by CETP inhibitors was not accompanied by any effect on prevention of cardiovascular mortality and morbidity? Can this happen also with other cholesterol-lowering drugs of the same class and of other classes? What mechanisms prevented a positive impact of cholesterol lowering on cardiovascular diseases incidence? Coming years will bring answers. Scientists now speculate that new ways of cholesterol lowering are needed. In light of CETP inhibitors failures there could be however a lower appetite of drug developers to bring another drug to development without a strong evidence of its potential to affect the cardiovascular disease rate in parallel to cholesterol lowering. It will be also interesting to watch how PCSK9 inhibitors will perform in outcome studies and whether they will translate significant cholesterol lowering into prevention of cardiovascular deaths and diseases. There is a hope for that.